Hey everyone! It's been pretty busy lately, so I thought it would be fun to give a bit of behind the scenes looks at one of my favorite year ending moments to wrap things up. In case you missed it, on December 16th, my image above was featured as the NASA Astronomy Picture of the Day. It's such an incredible honor to have one my photos selected for this feature. Since I was still away for a couple days when the image was featured, I didn't get to follow up on things as much as I would've liked. So, that prompted the idea for this post. I wanted to share a bit of the background and a closer look at everything that went in to creating this image all while being in the middle of a huge project. I'll cover a bit of the planning, the story from the night of the shoot, the gear I used and some post processing details. 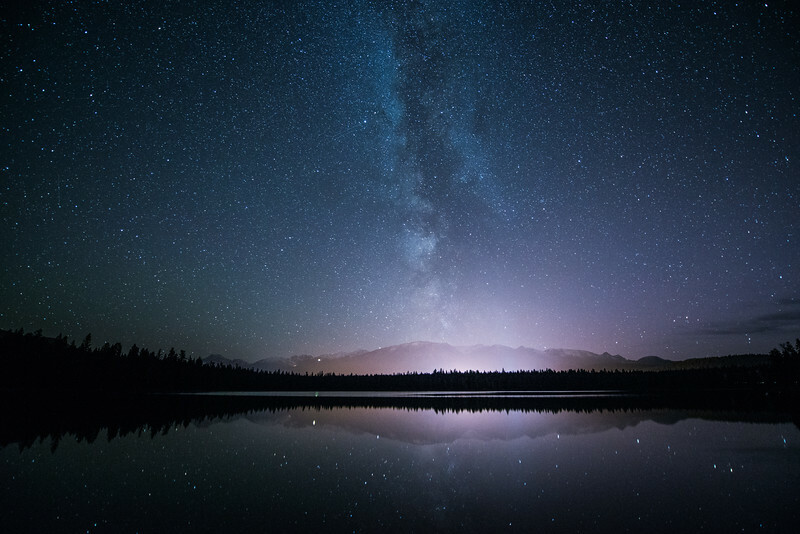 This image was taken right in the middle of leg 1 of a Travel Alberta timelapse project with Jeff Bartlett that had us visiting each of the six dark sky preserves in Alberta. On this portion of the trip, we would be hitting Cypress Hills, Waterton and Jasper National Park. These types of projects are always exciting, but completely exhausting. You're either traveling or scouting during the day and then awake most of the night shooting. A long night of shooting is normally followed by starting to load the images on to your laptop and making sure all of your batteries are charging back up. Sleep is occasional and coffee is abundant. We had already wrapped up a few successful days of shooting in Cypress and Waterton, so it's safe to say we were sufficiently exhausted by the time we made it to Jasper. I was really excited to head to Jasper and get a chance to explore and shoot during the Winter months. In the past, I've always visited in October during the Dark Sky Festival. On top of that, we would also be arriving right at the peak of the Geminid Meteor shower. The Geminids are normally one of the most active meteor showers of the year and also, one of my favorite events to photograph. So, being in a huge dark sky preserve is pretty much the best place in the world you can view one of the years most active meteor showers. The excitement doesn't end there either! There was also a decent chance of the Northern lights kicking up, too! I know this is starting to sound like an overloaded movie plot that couldn't decide what the climax was going to be, but that was certainly more than enough to keep us awake. When shooting a meteor shower, it's not uncommon to include the radiant point to increase your chances of catching a meteor. It sounds easy in practice, but you can easily go the whole night of shooting be lucky to catch one or two meteors. For the Geminids, the radiant point is the near Gemini constellation (also why it's referred to as the Geminids!). The Gemini constellation rises in the East and is pretty close to Orion's belt which can often be easier to pick out pretty quickly. Knowing that you might think, "Okay, the radiant is to the East. Just need to find a composition that nicely frames up the Eastern sky", right? Well, in most circumstances, you would be right. But, there was also a chance of the Northern lights! So, knowing we would still be able to see meteors throughout the sky, we prioritized a Northern facing direction. Although Jeff and I were going to be arriving a bit later, it helped that we were both pretty familiar with the park already. We initially thought about heading out on to the frozen Pyramid Lake, but because of the meteor shower, there would be too many stray lights from other stargazers. Since we were aiming to shoot timelapse sequences this would cause too much of a problem for us.We decided to head towards Lake Annette and Lake Edith. The road to these lakes closes in the Winter, but is easily walk-able. This meant we would be much less likely to come across any other stargazers out enjoying the meteor shower and would have less to worry about interrupting the timelapses. As we made our way toward the lakes, we were already seeing meteor after meteor. I'm not going to lie, this definitely made me a bit anxious and I really wanted to get everything set up. We decided on Lake Edith as it would provide the most clear view facing North and would just need to get our gear set up and compositions sorted. There's a lot that's completely out of your control and that can go wrong on any shoot. I normally try to balance the things I'm comfortable with and weigh out the possible reward when deciding on any unknown factors. From shooting to post processing, gear is one of the few things you have completely under your control. So, there's always the decision of what comes on a trip and then what gets used for each particular shoot. In most locations, we try to set up two different cameras that will be shooting timelapse sequences. You can use a different focal length and vary your composition to give more editing options later on. I'll often shoot one wide angle lens and use a 50mm or 85mm for the second camera. Since we were shooting during a meteor shower, I wanted both cameras to cover a decent amount of the sky. For that reason I selected two wide angle lenses. I've been using the Sigma 14mm for a while now and in most circumstances it will be on one of my cameras. I love shooting ultra wide and having the fast aperture makes it ideal for shooting at night. For the meteor shower, the 24mm made the perfect second lens to use. It would still cover a good amount of the sky while provide a different enough view that it wouldn't look like I simply moved my camera in a different direction. I selected a slightly shorter exposure for the second camera in case the Northern lights picked up. The shorter exposure would help pick up more detail and movement in each frame as opposed to the sightly longer exposure of the first camera. Straight from the camera, I knew the images might be slightly on the dark side, but I also was counting on being able to push them just enough in post later on. This can be a risky move if you're not familiar with how far you can push the files from your camera. I've recently started using an Induro GTT104M1 as my main tripod and have been really impressed so far. It pretty much has everything you could ask for in a tripod. Great reach, removable center column, lightweight, and still compact enough to strap to the side of my carry on bag. Both cameras were setup to shoot a few hundred photos and from there it was hands off and eyes up! 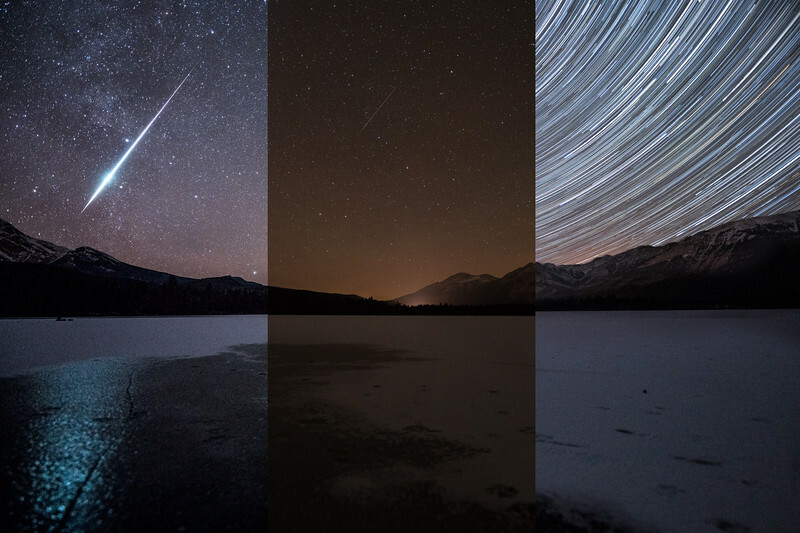 Seeing a bright meteor (often called a fireball) during a timelapse sequence can be as frustrating as it is exciting. You see this incredible light streak across the sky, but have no idea if your camera caught it! You can't stop your camera because you'll ruin your timelapse sequence, so you're forced to contain your excitement and then quickly scroll through hundreds of photos trying to find it. In total there were over 30 images that caught meteors out of the 470 that I took. Jeff and I saw an impressive amount of bright Gemind meteors while we were setup at Lake Edith and each time I had resist the urge to run and check. After we finished shooting, I scrolled through the back of my camera and caught a crazy amount of meteors throughout the 470 photos I took. Then I finally saw the huge fireball and couldn't wait to check it out on my laptop. When I got back to check it out, I was even more surprised and excited then seeing it on the back of my camera. One by one I noticed all four meteors in this single shot! You've probably see those really cool composite images that remove everything but the meteor from a few frames and put them all in the same shot. This was a mini-version of that, but all in a single 10 second exposure! I knew right away this was a special shot and couldn't wait to share it. Meteor showers are kind of like news events where the timing of your post can be pretty important to the traction it gets. The APOD Shot - Keep Reading!